for an upcoming bridal shower that is an afternoon tea luncheon, we are using these as prizes. bought a few extras to give to bride to be and the bridal party. it's perfect with our theme! . We used these as favors at a bridal luncheon. As teacups are very important to the bride and in fact a tea ceremony was part of her wedding, these were perfect reminders of a perfect day. They were exactly as advertised and pictured. Thank you Beaucoup for making this such an easy process. I couldn't find a more suitable shower gift. Perfect for the tea party theme, these candles are delightful to look at who doesn't like a candle. They will be a big hit. Perfect for the tea party shower! for the bride's "tea party" themed shower, these tea cup candles were perfect! Everyone loved them. The way they shipped was great. Each tea cup came in its own little box wrapped with a bow and a gift tag. No hassle party favors are the best! I'd buy these again for a shower gift or ladies luncheon. These items will be used for a thank-you gift. These items as beautifully made and boxed. These items are very delicate but are boxed so nicely and replaced so swiftly if broken. Excellent customer service. Thanks. Individually and beautifully packaged - very high quality. Perfect gift for a tea themed bridal shower - went down so well with guests. So impressed with this order!! I needed these tealight teacups for my daughter's teaparty wedding shower. The order was delivered promptly and on time. Everyone LOVED them. I was especially impressed with the way Beau-coup packaged my order - with a pretty tissue paper wrapping. A nice touch! I will definitely order from Beau-coup again :-) Thank you!! We gave these away as bridal shower favors. Needless to say, they were a big hit, as it was an afternoon tea. So cute! I got these for my sister's Tea Party themed shower and they were lovely. They were smaller than expected but that just made them more adorable. They fit perfectly with the theme and were enjoyed by the guests and the price was reasonable for the quantity I got. I would recommend these for your favors and they come already packed so no need to fuss over that! I bought these for my sister's bridal tea as the take home gifts. They are perfect! Bought these darling teacup candles for a bridal shower held at a tea room--they were just perfect and the guests loved them! This was a great bridal shower favor. To add to it I bought really nice tea satchel with different tea blends in each and attached one to each favor for the guests. I had 10 girlfriends to my house for a "Tea Party" to celebrate my birthday. I bought these adorable little Teacup/candle holders to give to each of my guests as a party favor. They were perfect, everyone loved them, and it was a nice surprise for them to receive a small gift. Perfect party favors for a Bridal Tea! These little tea cups and tea lights are the perfect party favors for a "Tea Party" themed Bridal Shower. I got these tea cup tea light holders for a tea party themed bridal shower. They are absolutely perfect. I wanted something that looked expensive, but cost efficient. My package arrived on time, and was packaged with care. I would definitely use Beau-coup again. will use this candle as decorations at a tea party themed bridal shower. When recieved the cups they are cute but smaller than expected. Got these for bridal shower favors. A real hit. 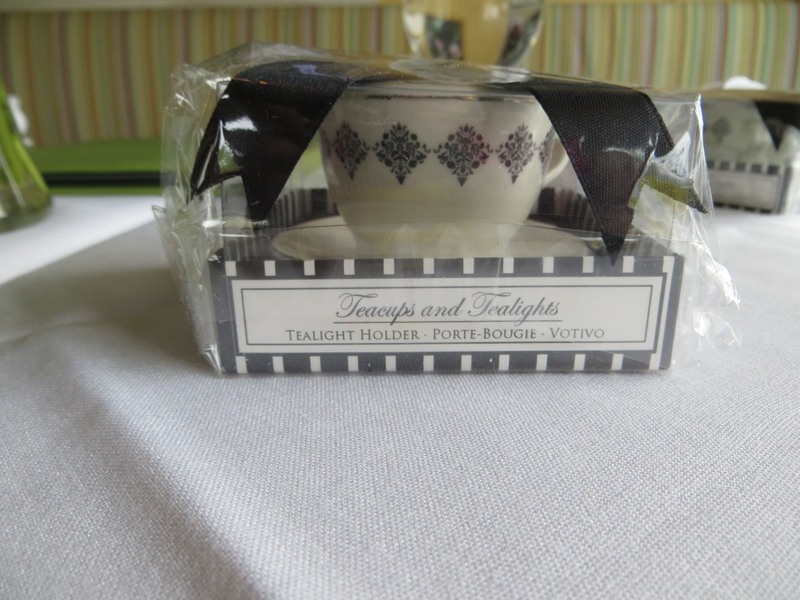 These teacup tealights were used as favors for guests at our bridal tea party themed shower. They were a little smaller than I had anticipated, but the small size made them even cuter! I like that the tealight candle easily comes out of the teacup, making it easy to replace when the tealight runs out. I need another occasion to buy more! These were a perfect favor for a recent bridal shower. The theme was Alice in Wonderland's Mad Hatter Tea Party Bridal Shower! Everyone loved them!! And, they are really high-quality! I'm waiting for the next occasion when I can buy more...maybe a baby shower with the same theme?!? I used these as a bridal shower thanks for coming gift. Everyone loved them and were delighted with the thought. It was a tea party bridal shower so they were perfect. Tea - it is just perfect - so very elegant - plus did not have to put anything together which was great for me. My guests for my daughters bridal shower were just so impressed with their gift of the tea cup. Even the Tea Party catering business wanted to know where I got them. I gave these as t-party favors for a bridal shower and everyone admired them. perfect for bridal shower t-party gifts! The guests at my daughter's bridal shower LOVED these favors. They are packaged and ready to hand out. When I put this in an organza bag with a personalized tea bag they were attractive and very well received by our guests at the bridal shower. I used these as party favors/thank you gifts for my daughter's Asian bridal shower tea along with mini chinese carry out containers in her wedding colors filled with sweet treats and finished with a personalized thank you tag. LOVE, LOVE, LOVE this tealight holder. These were perfect for my daughter's bridal shower. We had an English Tea Party and these were wonderful. Not too big, not to small. They are packaged very nicely in clear box with white ribbon. Everyone at the shower asked about them and were interested in checking the web to see what other "goodies" were available. I would order anything from beau-coup. I ordered these precious mini teacups for my daughters Bridal Tea Shower! They were much prettier in person and packaged very well. I did not have to do a thing but unpack them! They were a hit at the tea and everyone wanted to know where I had gotten them! Very, Very pleased!!! I would order this product again. The tea lights were perfect for my daughter's bridal shower tea. What a nice gift for the guests. So cute!! Very happy we had these!! They are petite, so they can't stand alone on a large banquet table. But, the extras got grabbed up by the bridesmaids because they are packaged so adorably!! The perfect bridal shower party favor! These teacup tealight holders made the tables look beautiful. Everyone loved receiving them as party favors, too. Simply Elegant! was our theme! 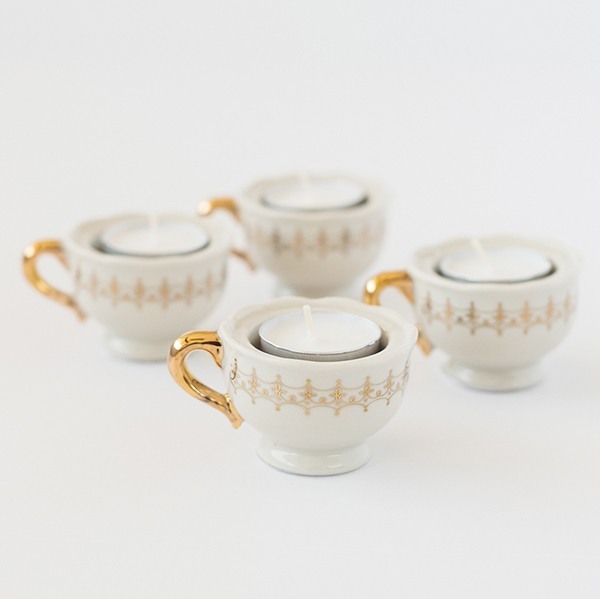 These adorable tea light candle holders exceeded my expectations! I used them on tables along with rose petals for our Simply Elegant themed afternoon tea party fundraiser and they were perfect! Easy clean up because you can toss the tea light candles afterwards and replace. We will use these again and again! I used these as a favor for a garden party I host once a year.The packaging was great and they would also make a perfect bridal shower favor as well. Very sweet favor for an engagement party! We had a Bridal Tea Party for my friend, who is a tea party kinda girl and this just added that special touch and provided a useful favor. I added these at the last minute for my daughter's bridal shower. I was so happy I did. They are beautiful and my daughter said she is going to use it as an ornament on her first Christmas tree! Nicely packaged and ready to give! I gave these as favors at a Bridal Tea; they looked beautiful on the tables, partly due to their nice packaging, complete with ribbon and tag. I purchased these tealights as a favor for my daughter-in-law's bridal tea. They were absolutely perfect! I wrote everyone's name on the teapot-shaped tag and used them as name cards. Everyone loved them. They came in a beautiful little plastic box with a ribbon and bow already on them. They were wonderful! these teacup candle holders were a hit at the bridal shower i hosted. everyone loved them. These little favors will lend a sweet touch to the tea party themed shower I'm having for my daughter-in-law-to-be. They are so perfect for a little take home gift for the guests. Very cute, great for bridal shower. I bought this favor well in advance. We did not have the bridal shower yet. But I like that it is pre-packaged, and is something anyone could use. My daughter (bride), loves tea, and I thought this could pay homage to her tea enthusiasm. I am useing them for a Bridal Shower Favor. Love that they are ready to hand out, they come in a nice with box, the ribbon and the tea pot tag. In my Irish mother's day a china teacup was a traditional shower gift for the bride-to-be. It makes a nice game prize too. An Elegant and Lovely Favor! I used these mini-teacup candles as a favor at my bridal shower. The shower had a vintage tea party theme and these were perfect. They are beautiful and delicate. They showed up in perfect shape - not a single one broke. Q:Is the candle in the teacup battery operated? Q:So if the gold ones come in a 4 pack... and I need 30.... do i select 30 or 8 (8 sets of 4) . Q:I know the gold ones come in a box of 4 to purchase. do each of the them come individually boxed with a bow like the silver ones do? Q:Do the gold teacup tea lights come in the gift box also? Q:Do they come with candles already in the cup? A:Yes, this item comes with the candles inside the cup. - Silver is sold in pieces and gold is sold in a set of 4. - Gold does not include a saucer. Teas, treats and sweets: all the makings of a terrific tête-à-tête. 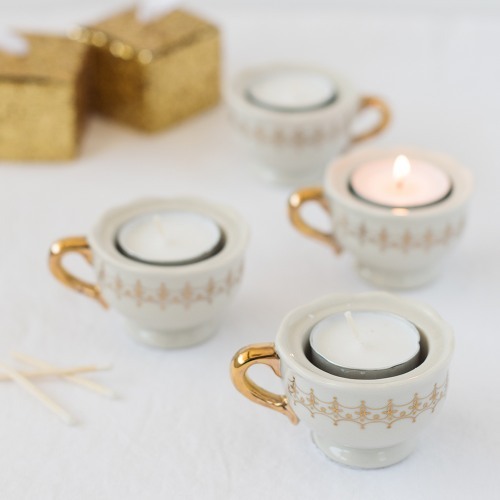 But if you're planning a truly fabulous tea-themed fete, you'll want to add mini teacup tealights. 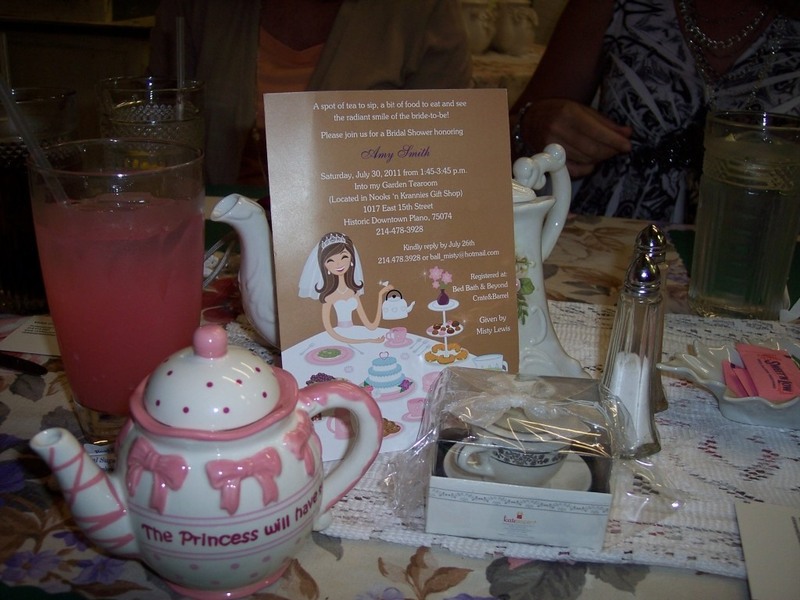 These truly elegant tea party favors are perfect for your tea party-themed bridal shower. Delicate detailing sets these beautiful favors far apart from the rest. Each is a miniature version of fine china, with intricate trim wrapped around gleaming snow-white porcelain. Even the tiny handle, smooth rim and saucer are lined in glimmering metallics.